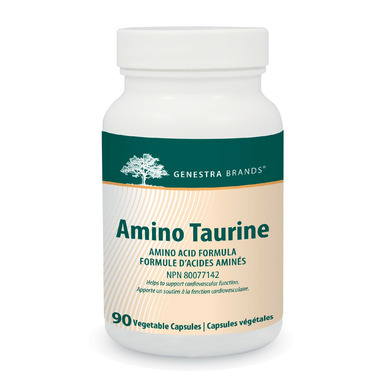 Amino Taurine supports cardiovascular function by providing 500 mg of taurine in each convenient capsule. High levels of taurine are present in the heart, where it may maintain intracellular calcium concentrations to support healthy heart rates. Taurine also plays an important role in maintaining normal endothelial cell function. It helps to regulate osmolarity and cytokine production in endothelial cells, and may also help protect them against oxidative damage. To further support cardiovascular function, taurine helps to regulate platelet activity and vascular contractility. Additionally, taurine contributes to arterial function through its role in lipid metabolism. Taurine stimulates the production of bile acids from cholesterol and helps to increase hepatic LDL clearance. Research suggests that taurine also supports cardiovascular function during and after exercise. By mediating calcium homeostasis and supporting heart and skeletal muscle contractions under exhaustive conditions, taurine may help to promote muscle performance and exercise capacity. Randomized, placebo-controlled trials have found that daily supplementation with 1,500 mg of taurine for two weeks significantly supports cardiac function and exercise capacity, while regulating the cytokine and thrombotic response to exercise.